Emmanuel Macron's first overseas trip since becoming president of France is to the West African nation of Mali. Across Africa, where France retains huge influence in its former colonies, his election has been celebrated in the hope that it will usher in a radical change in France's African policy. The BBC's Lamine Konkobo looks at what that change might look like. It was a very powerful, if subtle, symbol. 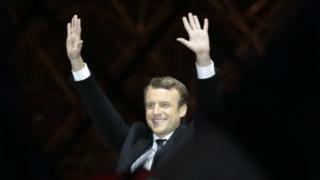 As supporters of Emmanuel Macron gathered at the Louvre's Esplanade in central Paris after his election victory earlier this month, the podium was turned for about 15 minutes into a gigantic dance floor by one of Ivory Coast's most famous bands. Magic System took to the stage, flooding the Parisian night with rhythms and dance moves not often heard and seen in this part of town. Mr Macron had originally taken to the stage to the European anthem Ode to Joy for his victory speech but for African audiences watching on television, this was their Ode to Joy moment. It was a nod to Africa; a nod that reflected the positive message of openness and universalism which has underlined Macron's winning campaign. It could also be seen as one in the eye for defeated far-right candidate Marine Le Pen, who must have felt repulsed by such a cultural invasion. If the sight of Magic System at the Louvre was refreshing for Africans, that is not why the French presidential contest was closely watched across Africa. Mr Macron is expected to deliver on issues of far greater importance in respect of the continent. Mr Macron did not say much about African policy on the campaign trail, because Africa was not a decisive topic that could give him the votes he needed to win. However, from what he did say about the continent, it appears that fighting Islamist militancy will be prominent on his African agenda. He was elected while France was under a state of emergency following a series of Islamist attacks in recent years, some of which were carried out by people with African links. "Africa is struggling more and more with terrorism," he told Jeune Afrique. "We saw it in Bamako [Mali], in Ouagadougou [Burkina Faso] and in Grand Bassam [Ivory Cost]." Islamist militants targeted hotels in all these places last year, killing many people, including foreign tourists. "Everyone should get involved in the fight against terrorism," he said. France has deployed about 4,000 troops in the Sahel region of Africa as part of the anti-terrorism Barkhane operation. They were deployed to Mali in 2013 to prevent Islamist groups who had taken over the north of the country, from advancing on the capital, Bamako. In Mali, he will visit French troops based in the northern city of Gao. The president-elect has no plan of withdrawing these troops in the foreseeable future. On the military front, France's policy in Africa under Mr Macron will be more of the same. There is a famous saying that nations have no permanent friends but only permanent interests. Mr Macron has been elected to serve France's interests and he will do so in his relationship with Africa, political analyst Serge Theophile Balima told the BBC. "Macron is a neo-liberal who believes in businesses and trade," Mr Balima says. "He will do his utmost to open Africa to a maximum of French businesses. That is obvious." However, the new president believes that partnership with the continent will be more beneficial if Africa is strong. As a candidate, he vowed to lobby the G20 at its July summit in Germany to support economic development in African countries. In more clearer terms he has pledged to channel to Africa most of France's foreign aid, which he intends to increase to 0.7% of his country's GDP. However, Mr Macron comes to power at a time when a growing movement of economists and political leaders have been pushing for a major reform they view as more empowering than aid. One sign of France's continued influence over its former colonies is the CFA franc, which is pegged to the euro with the financial backing of the French treasury. Critics say true economic development for the 14 African countries can only be achieved if they shake off the CFA currency. Some argue that in exchange for the "luxury" of the guarantee provided by the French treasury, the African countries channel more money to France than they receive in aid. Ms Le Pen said that if elected, she would drop the link. While no previous French president has ever expressed a willingness to let go of the CFA, Mr Macron says the decision to move away from it is for African countries to take. France's African policy has come under attack from pro-democracy activists since the 1990 Baule conference, at which former President Francois Mitterand issued a call for African countries to embrace democracy, following the fall of the Berlin Wall. Critics have consistently railed against what they perceive as a form of hypocrisy. They say France has repeatedly used anti-democratic means on the continent to further dictatorships or overthrow unfriendly governments if they serve French interests, while openly extolling democratic values. The system of personal networks which backed these controversial practices is pejoratively referred to as "Francafrique". The times are long gone when a French commando unit would fly parachutes in broad daylight into an African capital to restore a deposed head of state. But Francafrique is not totally dead. Mr Macron says he will finally kill it off. He says he will defend and respect fundamental democratic principles everywhere in Africa, working with the African Union and regional organisations. But how will he deliver where his predecessors failed to meet similar promises? "I think he is in a position to bring that end," analyst Mr Balima told the BBC. "First of all, he is young. He does not belong to the old generation. He has few friends in the Mafiosi circles in Francophone Africa." "When meeting African heads of state, some will be embarrassed to speak to this man who could be their son." African leaders will no longer benefit from the former era's complicity, Mr Balima says. "A head of state in a situation of bad governance... could not count on Macron to mobilise the French army to quash a rebellion in a military barracks." If Mr Macron delivers on that promise, he would indeed turn a page that has been a source of much acrimony in French-African relations. And how France should remember its colonial legacy is closely related to the issue of whether it still pursues a neo-colonial policy in Africa. Right-leaning French political leaders have long maintained that colonisation was not only about forced labour, exploitation and mass graves but that colonised countries also benefited. In 2005, under President Jacques Chirac, a provision enshrining that patriotic view in law was passed. However, it was repealed a year later as a result of an outcry in France as well as in some of its former colonies and overseas territories. Nicholas Sarkozy, as a candidate and later on as president, often complained about being tired of endlessly apologising for his country's past transgressions. Unlike those politicians on the right, Mr Macron considers that recognising the wrongs France did in its past interaction with African people is crucial in redefining the type of dialogue necessary for the new relationship with the continent. As a candidate on a visit to Algeria, he stirred a controversy by branding as a crime against humanity France's colonial war in Algeria. While that statement was condemned by Ms Le Pen and her supporters, it was well received across the whole of French-speaking Africa. What was strikingly different between Mr Macron and Ms Le Pen was how the two approached immigration. Ms Le Pen's closed-border proposition was that she "has love for the Africans but only if they are at home in Africa", while Mr Macron has defended a policy of immigration that should be defined by France's needs. In other words, under President Macron, there would be no reason to stop an African from coming to France if they have skills that are useful to the country's economy. Since the 1970s, waves of migrants from North Africa and then former colonies south of the Sahara have found their way into France, playing a role in various sectors of the country's economy. Mr Macron does not say he will make immigration from Africa easier. But nor will he obsess about tightening immigration control to stem a real or supposed flow of migrants from Africa. "That is part of the dynamics of [his] liberalism," Mr Balima told the BBC. The president-elect has said he would encourage foreign students and those with useful skills to move to France. With Mr Macron's liberal attitude to immigration, isn't there a fear that Africa might end up losing its best talents? Not really, says Mr Balima. "There will always be enough manpower within Africa for the development of Africa." Will Macron mean the blues or a boost for Brexit?